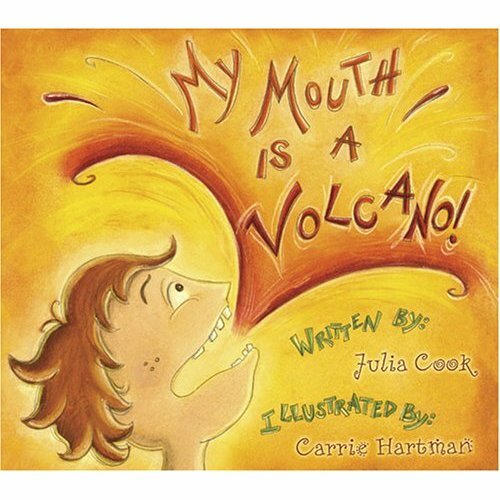 Browsing through amazon.com and I found this book; My Mouth is a Volcano by Julia Cook. This is a book about Louis who has a habit of interrupting people. "All of his thoughts are very important to him and when he has something to say, his words rumble and grumble in his tummy, they wiggle and jiggle on his tongue, and press firmly against his teeth, right before he ERUPTS (or interrupts). His mouth is a volcano! " I received my copy today and planned to read it to him tonight. Its a book with simple words, some of them repetition, especially the part where Louis' mind start think/racing and thoughts transforms into words which he eagerly want to share with every one. I tickled Little DinoEgg's tummy when I read the part about "his words rumble and grumble in his tummy" , this makes reading more interactive and exciting. The book recognizes that a child's words and thoughts ARE important, he probably can't wait to share with the whole world but it is rude to interrupts n chatter non stop, disregarding every one. It teaches the child in a fun way to show respect for others and to wait for their turn to speak. You guessed it. Little DinoEgg is like Louis. He can go "mummy, mummy, MUM-MYYY!!" when I'm in the middle of a conversation/discussion, on the phone or in the midst of doing some work. No amount of teaching, explaining, scolding or what-so-ever drills the idea of DO NOT INTERRUPT into his head. He does this to every one and any one. Some people gets frustrated or feels irked at this rude boy. Some people are understanding and patient. Its time to teach him to be patient n wait for his turn to speak. Otherwise I fear that when he starts primary school he will be distracting every one in the class.